Today companies are striving to provide a more customer-centric experience. Being able to understand and predict customer behavior can help forge a lasting, profitable relationship between customers and your company. The insights that make this possible are hiding in big data-and you can find them. 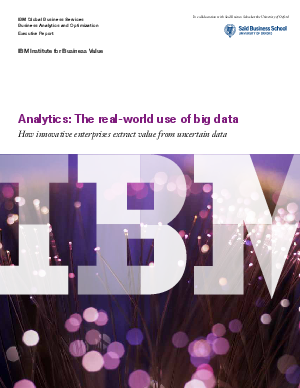 Read the study "Analytics: The real-world use of big data," conducted by the IBM® Institute for Business Value and the Saïd Business School at the University of Oxford. In it you'll see how over 1,100 business and IT professionals from 95 countries are maximizing the potential of big data. Share this informative study with your colleagues.